There are many types of projection screens available to rent. Typically, in the rental space most people use tripod or fastfold screens. Of course with projection mapping and other technologies becoming more commonly used, projecting onto objects and walls it is becoming more and more popular too. In this projector screen rental guide we’ll give you the information you need to understand the different rental options available so that you an make an informed choice. 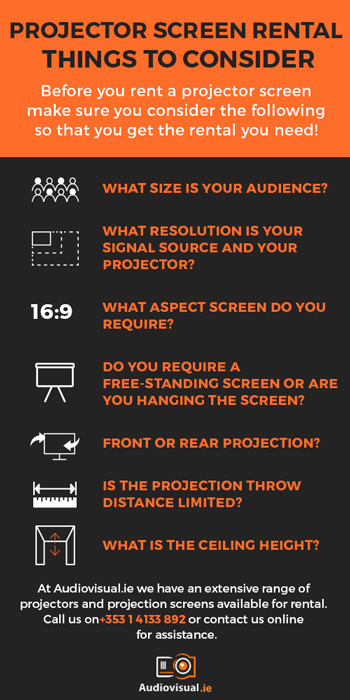 When you are choosing a projection screen you need to consider the size of the screen and the shape (or aspect ratio) of the screen. The aspect ratio refers to the shape of the screen. The most common are as follows: Typically up until a few years ago most laptops and sources used 4:3 Video aspect running typically a 1024 x 768 resolution. More recently with the arrival of Full HD & 4k UHD & 8K UHD Resolutions, we see 16:9 screens everywhere. A lot of projectors will run WUXGA resolution (1920 x 1200 pixels) these project a 16:10 aspect. When you are booking a rental screen, it is vital that you know what your source resolution will be and what projector you will be using? Audiovisual.ie will always confirm which aspect screen you require. Before you rent a projector screen make sure you consider the following so that you get the rental you need! What size is your audience? The bigger the crowd, the bigger the screen needed. The bigger the screen, the more powerful the projector needed. What resolution is your signal source and your projector? This will determine the shape the screen required. What aspect screen do you require? Don’t get it wrong. An AV professional will advise you. Do you require a free-standing screen or are you hanging the screen? Fastfold screen if hanging. Tripod or fastfold if free standing. Do you want the projector in front of or behind the screen? Rear projection only available with fastfold option. Is the projection throw distance limited? If you need a large format display rental, you need to make sure you have the suitable space require for the projector to fill the screen. What is the ceiling height? Bear in mind that if you have a 6’ high screen and your ceiling height is 8’, the bottom of your image will be only 2’ from the floor. This is often over looked and can cause problems with larger screen sizes. When it comes to renting projectors there are two parts to the equation, the projector and the screen. When it comes to screens for projectors you have two main options. TRIPOD SCREENS: These are your typical roll up screens with built in legs. Typical sizes are 150cm (5ft), 180cm (6ft) and 240cm (8ft) wide. 180cm is the most common. Tripod screens have the advantage of being portable and having the ability to fit many aspect ratios by simply extending the screen more or less to create a square or widescreen shape. FASTFOLD SCREENS: Fastfold screens are tensioned screens that feature a foldable aluminium frame and a screen surface which attaches via push studs, tensioning the surface for an extremely flat projection screen. Fastfold screen can also be used in front or rear projection format. Rear projection allows you to reverse project images and thus locate the projector behind the screen for a clean looking set. Rear projection fastfold screens can also be incorporated into stage sets for conferences and event sets. Although they can get quite large, they are generally quite lightweight. At Audiovisual.ie we have an extensive range of projectors and projection screens available for rental. Call us on 01 4133892, email me directly on ivan@audiovisual.ie or contact us online for for assistance.